As much as some beer drinkers may decry the existence of flavored brews, there's no disputing the fact that Bud Light Lime is wildly popular, especially during the summer months. And if we're being honest it's not a total shock, considering there's nothing quite like a crisp, slightly sweet and effervescent adult beverage with a hint of lime on a hot afternoon. 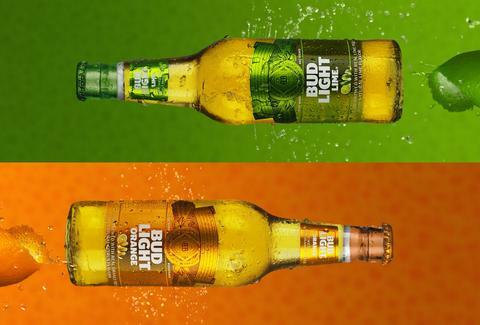 Now, the folks at Bud Light have decided to give fans of their citrusy flavored offerings yet another choice by adding Bud Light Orange to the mix for the first time ever. Just in time for t-shirt weather and backyard BBQs, Bud Light just pulled back the curtain on its latest citrus-spiked beer, Bud Light Orange, which hits shelves for the first time this month. Like its lime-flavored counterpart, this one is brewed with actual peels from the fruit it's meant to taste like, to give it an authentic hint of orange flavor. So, why orange and not some other fruity flavor? Well, according to Bud Light's market research citrus flavors account for not only 84% of the flavored beer category, but the orange-flavored beer segment specifically has grown 600% in the last five years. And whether or not you're pumped to try it, you can thank millennials for its mere existence. If you haven't seen BLO at your local supermarket yet, keep your eyes peeled. It'll be available beginning now through September.